38 photographs. - 1 postcard. Andrew Sangster was born in Sherbrooke on 8 February 1868. His parents James Sangster and Isabella Michie came to Sherbrooke from Scotland in 1867 to work at the Paton Manufacturing Company. In 1898, Andrew Sangster married Maude Griff; they had three children, Dorothy, Muriel, and Gordon. Sangster studied in Sherbrooke and in Almonte, Ontario. At 14, he began working at the Paton Manufacturing Company. He later worked various Sherbrooke firms, first as a machinist for the Jenckes Machine Company and the Edison Electric Company, and eventually rising to the position of Superintendent with the Canadian Rand Drill Company. He retired in 1932. He died in Sherbrooke on 18 April 1936. His residence was sold in 1940 and became the priest's resident for the catholic parish of Ste-Jeanne d'Arc on Galt Street West. Sangster Park in Sherbrooke was named in Andrew Sangster's memory. 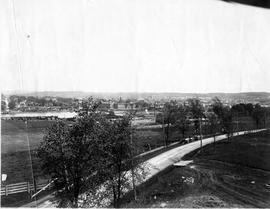 The fonds contains source material on urban development of the city of Sherbrooke and on flooding in the area during the latter part of the 19th century and the early 20th century. It consists of 13 individual photographs, a postcard and an album containing 25 photos. The contents of the album include seven photographs taken in Cape Breton and at the Chicago World's Fair. Three of the album's photos were taken by George Johnston and one by Wilbur Burton Finley, both turn-of-the-century Sherbrooke photographers. In the collection as a whole are found views of the Magog and Saint Francis rivers; Dufferin, Lansdowne, Grand Forks and Fairmount streets; bridges; a power station; factories such as the Paton and Jenckes; University of Bishop's College; panoramas of Sherbrooke; an aerial view of Sherbrooke; and flooding in downtown Sherbrooke. Leafs of tissue paper have been inserted between the album's pages. Individual photographs have been placed in polyester sleeves. The fonds was donated in 1985 and in 2011 by Elzada I. Cass, granddaughter of Andrew Sangster. The captions are in English.